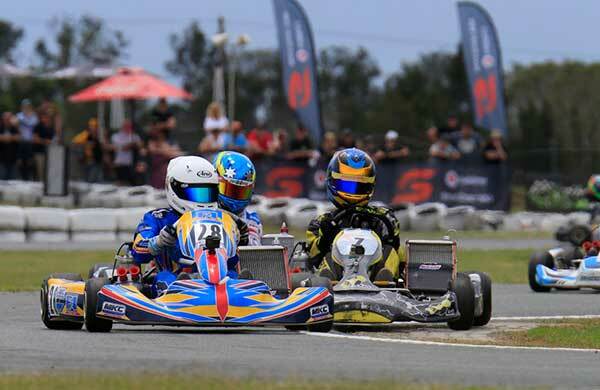 The Race of Stars has started with a bang on the Gold Coast with some sensational racing throughout qualifying day at the Xtreme Karting complex. The large number of spectators in attendance witnessed a spectacular battle in the second heat of the elite KZ2 gearbox category. A battle between Pierce Lehane, Marijn Kremers and karting icon, Davide Fore was stoic before Fore’s run was cut short when Fore stopped his Gold Kart with a gear selector issue. After qualifying fastest, Fore had been stoic throughout the opening two races, crossing the line first in heat one after a brilliant battle with World Champion, Paolo de Conto. Unfortunately, Fore received a starting penalty dropping him to eighth in the classifications. With Fore off track in heat two, it opened the door for BirelART’s former European Champion, Rick Dreezen to slot into third place. Dreezen qualified in 10th placing, but was able to elevate himself to third in both races held today. Notable performances came from Energy Corse drivers, Joel Johansson and Tasmanian Zane Wyatt. Swede Johansson suffered an engine drama in qualifying which saw him start from the rear of the grid. In both races, Johansson charged through the field. In the second heat, he took Wyatt with him to finish just outside the top 10. CRG’s de Conto staged a thrilling comeback in heat two after missing the start and being mired down the order, he came back to end the race inside the top 10. Cody Burcher and Jac Preston shared the honours in the elite Junior KA2 category. Both races were hotly contested with a cracking pace at the front. Switching to JC Kart this weekend has been working well for Harrison Hoey who picked up a pair of second places. FA Kart pilot, Matthew Hillyer is piecing together his a pair of third placings on debut in the elite junior KA2 category. Earlier today, the field was stunned when JC Kart pilot, Jai Brown set the pace in qualifying. Another to impress so far this weekend has been EVO Kart driver, Zak Lobko. The entertaining KA3 category is well poised with any number of drivers in contention to win. All three heats went to different drivers, with Jace Matthews, Thomas Davies and Australian Champion, James Sera sharing the wins. Others to impress at stages throughout the day include Beck Connell, Christian Pancione in his first senior event and Kurtis Read – the son of Australian Top Fuel Drag Racing Champion, Phil Read. Declan Matthews has led the way in KA4 Junior off the back of the success of brother, Jace in KA3. He has taken two race wins in his Ricciardo Kart, however Victorian Bailey Collins has been right up the front and took the second heat race win. South Australian Corsa Kart driver Blake Purdie is right in the mix making the step-up to open Junior racing for this event. KA3 Junior has delivered three different race winners across the heats with Tasmanian Tate Frost, Zachary Heard and Harrison Hoey sharing the wins. There are a number of drivers in the hunt though, with Jonathon Marcusson showing pace aboard his Praga Kart, Jackson Souslin-Harlow among the front runners and this afternoon, Lachlan Hughes began to show form after what has been a challenging day for the KA2 Australia #2. Kris Walton has proven to be a strong force in the oversubscribed TaG 125 category taking two wins and a second. The field had to be split into three groups after qualifying and produced four entertaining races. Australian Champion, Brendan Nelson took a heat race win in his FA Kart as did Marc Tulloch. Others to produce solid performances at the front of the pack included Morgan Feast, HDR Arrow driver, Luke Grasso, Tony Kart Australia’s Cian Fothergill and Flynn Jackes. The youngest Race of Stars category, Cadet 12 has been an EVO Kart benefit with Adrian Haak taking the pole position and two heat race victories. The other heat race fell the way of his team-mate Christian Mansell – who completed the EVO front row lockout in qualifying. The racing throughout the day – as always – has been superb from the Vortex Mini ROK powered class with Carter Mobbs, Hugo Simpson and Marcos Flack all well involved in the fight at the front. 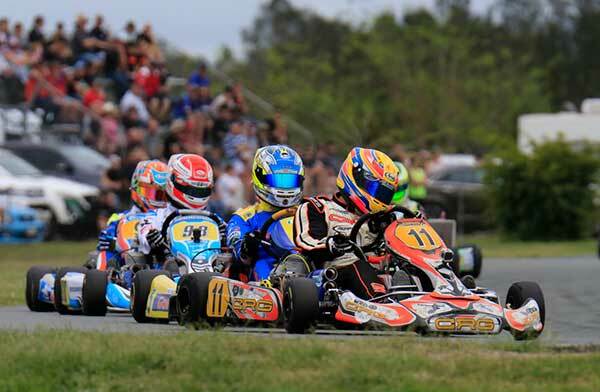 Action returns to the Xtreme Karting Complex on 540 Pimpama Road from 9am tomorrow with the continuation of heats. Driver’s Parade will take place at 11:40am with the Finals beginning at 12:30pm. Live Timing can be followed through the MyLaps Speedhive – either online (https://speedhive.mylaps.com/Events/1471530) – or through the mobile application, downloadable at the App Store suited to your preferred device/operating system. Videos from throughout the event are available at www.facebook.com/raceofstars.